As a storyteller and puppeteer, I spend a lot of time researching and adapting folktales from around the British Isles and from other parts of the world. Having worked on the Isle of Man as a performer for over 20 years, I’ve developed a collection of Manx Tales for my storytelling work. 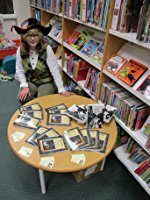 In 2014 I was approached by The History Press to write a book of Manx Folk Tales, told as I would perform them to an audience, and accessible to modern readers. Published in 2015. This photo is of the book launch in Crickhowell Library (courtesy of Book-ish, the independent bookshop there). It is now widely available in bookshops on the Isle of Man, and elsewhere. I am currently working on a book of Welsh Folk Tales, especially those from Blaenau Gwent, where I now live. This will be illustrated by Denise McCoid, who created the beautiful illustrations for Manx Folk Tales. 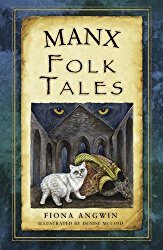 This video, which is an interview about my book “Manx Folk Tales”, was created by Adam Smith of Hidden Art Films. Thanks so much, Adam!